I am delighted to announce that my story “Coriander for the Hidden” will appear in Interzone issue 280, which will be out in March of 2019! This is another long-time career goal finally achieved! Some of you may have heard me read “Coriander” at the NYRSF reading series earlier this year. For the rest of you, it will be brand new! I’ll be sure to let you know when the issue is available. The Doctor Who revival’s 11th season has been something of a mixed bag, in my opinion. I thought it started out strongly with “The Woman Who Fell to Earth,” “The Ghost Monument,” and “Rosa,” then went through some peaks and valleys afterward. For every strong episode like “Demons of the Punjab” or “Kerblam!,” there was a mediocre episode like “The Witchfinders,” or even a straight up bad one like “Arachnids in the UK.” I’m very happy to report, then, that the season finale, “The Battle of Ranskoor Av Kolos,” is a return to the strength of the season’s early episodes. It’s fitting to call “Battle” equal in quality to the season opener, “The Woman Who Fell to Earth,” because together they form bookends to the season. The Senza warrior Tzim-Sha, whom the Doctor banished from Earth at the end of “Woman,” reappears in “Battle” with vengeance on his mind. To be honest, I found the wounded, sick, and angry Tzim-Sha of this episode to be even scarier than he was in “Woman”! With additional callbacks to the episodes “The Ghost Monument” and “Demons of the Punjab,” it feels like the season has come full circle and offers a kind of closure. It’s not a season-long arc, exactly, but it helps make the season feel like a cohesive whole. I liked when Graham tells the Doctor he’s going to kill Tzim-Sha for what he did to Grace back in “Woman.” Finally, I thought, some conflict! Unfortunately, I thought the conversation that follows suffers from the same lack of emotional depth that has plagued the writing in many episodes this season. Their conversation feels very stilted and cliched. How many times have we heard someone say, “If you kill him, you become just like him”? I would much rather have seen the Doctor tell Graham about the toll that comes with taking a life, speaking from her own experience, or even seen her get mad at Graham and tell him she didn’t ferry him all the way across space and time so he could have revenge. Instead, the conversation feels rushed and by-the-numbers to me. I wanted more emotion, a criticism I found myself repeating often throughout the season. As for Tzim-Sha’s plan, I have to admit I didn’t fully understand it. Why keep the crews from the crashed ships alive in stasis? He can’t leave this planet, so he can’t bring them back to the Stenza homeworld as trophies. Also, why shrink the other planets down instead of just destroying them? Maybe that has more to do with the Stenza idea of keeping trophies, but still, it seems overly complicated. Then again, I should have stopped trying to make sense of Doctor Who villains’ plans a long time ago, as they rarely make sense. Anyway, I liked “The Battle of Ranskoor Av Kolos” a lot, and I’m so relieved this up-and-down season ended on a high note. I like the cast and the character development of Graham and Ryan, I just hope next season we’ll have a little more emotional depth. And also maybe a little more Yaz? And now for some Doctor Who neepery! The Doctor mentioned the TARDIS once regressed a Slitheen back into an egg, which is a reference to the events of the 2005 Ninth Doctor episode “Boom Town.” She also mentions the TARDIS once towed the Earth “halfway across the universe,” which is a reference to the 2008 Tenth Doctor episode “Journey’s End,” which coincidentally also dealt with stolen planets. Another story that deals with stolen planets, and miniaturized ones at that, is the 1978 Fourth Doctor serial “The Pirate Planet,” in which the hollow planet Zanak would materialize around other planets, plunder their mineral wealth, and then crush those planets down to tiny rocks. One such shrunken planet was Calufrax, which turned out to be a disguised segment of the Key to Time, a cube composed of crystalline shards that look remarkably similar to the ones Tzim-Sha was keeping his own shrunken planets in! Next up, a New Year’s Day special (in which it is rumored the Daleks, whom we haven’t seen since 2015’s Twelfth Doctor episode “The Witch’s Familiar,” will return), and then…no new episodes until 2020? Say it ain’t so! These long breaks between seasons are a drag! Often when we think of scary things — especially when we’re talking mystery/thrillers — we expect serial killers that gruesomely torture their victims, or a psycho who kidnaps a child, or a radical religious faction getting ahold of a weapon of mass destruction that threatens the lives of millions. 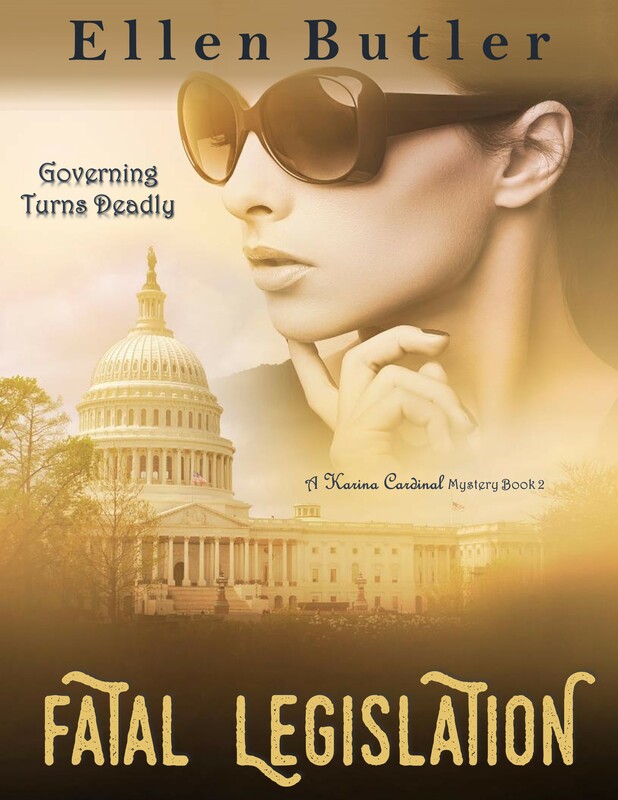 Well, in Fatal Legislation, the scariest part is much sneakier and more sinister due to manner in which it subtly affects not only the victims in the book, but also the way in which it can affect every American who is electronically plugged in to society. Spoiler Alert: Fatal Legislation begins with the death of a senator. We soon find out that what seems like your run-of-the-mill heart attack is, instead, a targeted murder, using the senator’s own pacemaker to kill him. Yes, you read correctly, someone hacks the senator’s pacemaker and speeds it up so fast the blood can’t pump properly through his body, and boom — dead senator. Science fiction! You might cry. If only that were true. The idea to kill off someone in this manner for one of my Karina Cardinal Mysteries came from a recall ad that ran on television the summer of 2016. That wasn’t the first or last recall notice for pacemakers. According to CNET, in May of 2018, “Abbott (formerly St. Jude Medical) is recalling some 350,000 implantable defibrillators to help protect patients from any spy-movie style assassination attempts or other issues.”I reached out to a cybersecurity specialist to find out more about this phenomenon, and the answer I got was very unsettling. He basically said, “Anything with firmware can be hacked.” To counteract this, Abbott and other companies with pacemakers vulnerable to hacks have created firmware updates to forestall such a hack. Unfortunately, the fix is only good until another hacker finds a different weakness. I’m sure you’re thinking, “I don’t have a pacemaker, so I’m safe.” Maybe you’re right. However, you might be vulnerable in a different manner — one that affects your right to privacy. Do you have a smart phone? Smart TV, smart refrigerator, maybe a smart HVAC system with a temperature that can be adjusted from afar. One of these items in your house may already have been hacked and been used for a nefarious purpose without your knowledge. Here’s a “for instance” that was explained to me, and the reason I’m not allowed to hook our smart appliances up to our wi-fi. Hackers that attack important systems and high visibility websites — such as government or financial institutions — will do something in the biz called D-DoS or a denial of service attack. Basically, making the site unavailable to users temporarily or indefinitely. In order to do this, a hacker will flood the intended victim’s server with a ridiculous amount of incoming traffic so legitimate users can’t get in. A hacker may have hacked your smart TV, or dishwasher, and is utilizing it to help with this D-DoS attack. . . and you’d never know it. These smart appliances are particularly vulnerable, because most manufacturers don’t continually renew the patches to keep out these types of hacks. If you have a computer or phone, you’ll notice the apps and software are being constantly updated. Not so with your fancy new air-conditioner. We have welcomed these devices into our homes, purses and pockets. Yet, by doing so, we have made ourselves more vulnerable to cyber attacks and surveillance. The question is no longer if you’ll be hacked, it’s when. And what the fall out will be when you are. Ellen Butler is a bestselling author writing critically acclaimed suspense and award-winning historical fiction. Her experiences working at a medical association in Washington, D.C. inspired the Karina Cardinal series. She is a member of Sisters in Crime, International Thriller Writers, and the Office of Strategic Services Society. This was a deep and thoughtful horror story; here there is no right and wrong, just humanity’s fortes and foibles. A hard-to-put-down read. Click through the read the rest, including reviews of all the other stories in the magazine as well!